“candle of the forest”, defining the habitat of the genus, which are in fact dry forests with seasonal rainfall. A genus of epiphytic or climbing plants, sturdy, strongly branched, with creeping stems usually three-angled, segmented, sometimes exceeding 10 m long and producing aerial roots. Areoles slightly woolly, spines very short, few, sometimes absent. Flowers nocturnal, self-sterile, very large (the largest of all the family of Cactaceae is H. calcaratus with 30cm in diameter), funnel-shaped, with a sturdy floral tube, white (rarely red), pollinated by bats (Artibeus jamaicensis and A. lituratus for H. lemairei and Choeronycteris mexicana, Leptonycteris curasoae and L. yerbabuenae for H. undatus) and sphingideae (H. costaricensis according to Harber 1983, in Emerson 2007). Fruits globose to elongated, large, fleshy, edible, usually red but also yellow or orange, covered with wide, soft, flexible and sharp scales, opening irregularly when mature, retaining or not the remains of the dried out perianth. Seeds rather large, more or less droplet-shaped, brown. 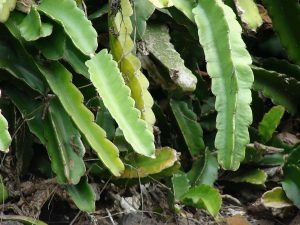 The genus Hylocereus grows mostly in the shade, in dry or rainforests, semi-epiphytic, climbing to the trees by using aerial roots, or on rocks, from sea level up to 2200 m in altitude. Antigua, Argentina (Corrientes, Misiones), Barbardos, Belize, Bolivia, Brazil (Bahia, Espirito Santo, Goias, Mato Grosso, Minas Gerais, Para, Parana, Pernambuco, Rio de Janeiro), Colombia (Bolivar, Cundinamarca, Guajira, Magdalena, Santander, Vaupes), Costa Rica (Alajuela, Guanacaste, Heredia, Limon, Puntarenas, San Jose), Cuba, Dominican Republic, Ecuador (Azuay, Chimborazo, Concepcion, El Oro, Guayas, Loja, Los Rios, Manabi), Grenadines (Bequia), Guatemala (Alta + Baja Verapaz, Chimaltenango, Chiquimula, El Progreso, Escuintla, Guatemala, Huehuetenango, Izabal, Jutiapa, Peten, Quetzaltenango, Quiche, Retalhuleu, San Marcos, Santa Rosa, Suchitepequez, Zacapa), Grenada, Guyana, French Guyana, Haiti, Honduras (Atlantida, Yoro), Virgin Islands, Jamaica, Mexico (Chiapas, Colima, Distrito Federal, Guerrero, Jalisco, Michoacan, Nayarit, Sinaloa, Veracruz, Yucatan?) Montserrat, Nicaragua, Panama (Veraguas), Paraguay, (Concepcion, Paraguari, Presidente Hayes), Peru (Amazonas, Huanuco, Jaen, Junin, Lambayeque, Loreto, Piura, San Martin, Tumbes), Puerto Rico, Saba, St Eustache, St Vincent, Surinam (Brokopondo), Trinidad and Tobago, Venezuela (Anzoategui, Bolivar, Carabobo, Cojedes, Delta Amacuro, Distrito Federal, Falcon, Guarico, Lara, Portuguesa, Sucre, Zulia). Hylocereus undatus is grown worldwide in tropical area, especially in southeast Asia for its fruits (dragon fruit). Its origin is uncertain.